Wall Ball is a dynamic exercise that builds the quadriceps, gluteus muscles, hamstrings and calves. It also works the shoulders and the upper back. 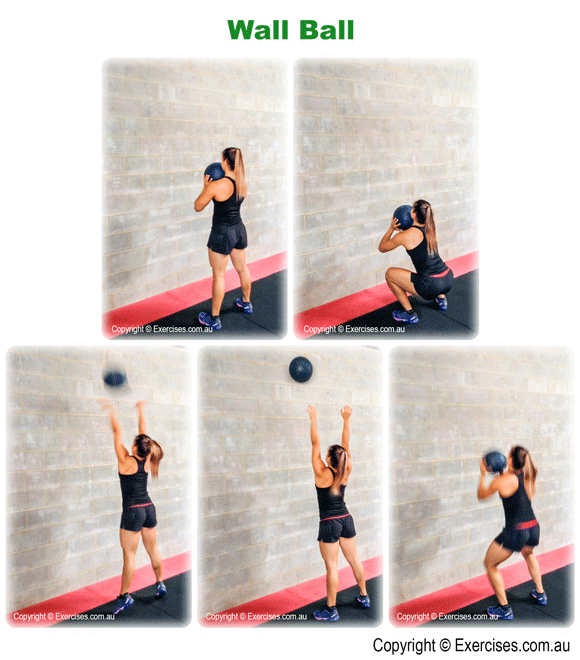 Wall Ball actively engages the core section to accommodate shifts in weight and to maintain correct upper body position throughout the exercise. Wall Ball will develop power, coordination, mobility and balance. This is an excellent exercise to improve your level of conditioning. It can be done as a straight set exercise or as time under tension. Face the wall and place a medicine ball between your legs. Assume a shoulder width position. Squat down, pick up the medicine ball and position it on your upper chest. Keep your core tight throughout the exercise. Slightly angle your feet outside. Squat back down by bending at the hips then the knees. Descend until your hips are below your knees. At the bottom position, your knees must be over your feet. 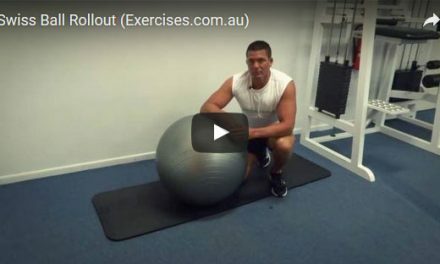 Maintain a secure grip on the medicine ball. Focus on your target on the wall. Explosively push your heels through the floor. Extend at the knees then drive your hips forward to generate power from the legs to propel your arms to throw the wall upward toward the target. On return, catch the medicine ball and allow the momentum to bring you back to the bottom position of the Squat. Common fault in performing Wall Ball is not descending to the full Squat position. This limits the range of motion in the exercise and reduces the amount of power that can be generated from the hips. Another fault is not staying focused on the target on the wall. You have to throw the medicine ball in a straight line so you can catch it fluidly on return.